The GE-McKinsey Matrix was developed in response to the shortcomings of the BCG Matrix, which does not account for a number of factors. It was originally used for a visual representation of GE’s 150 business units to determine which business units were doing well, which needed support, and which should be discontinued. However, the matrix can also be applied to a product portfolio. It evaluates each product on two parameters, market attractiveness and product position, which are the labels of the axes on the matrix. Market attractiveness and product position are determined by a weighted score for all the relevant factors that contribute to each. There are three levels for each parameter—high, medium, and low—giving the matrix nine boxes in total. The placement of each product on the matrix determines the strategy to be used for the product. A-6 shows the GE-McKinsey Matrix. Products that fall above the diagonal line are high performers, or are those with potential for either growth or cash flow. These are the products on which a company should focus. Products that fall below the diagonal line are those that typically drain a company’s resources, with small returns and little potential for growth. These products should be analyzed thoroughly to determine which can benefit from selective investment in order to move them above the diagonal, and which need to be discontinued. The factors used to determine market attractiveness are market growth, market size, opportunity to differentiate product and/or services from others in the market, profitability, intensity of competition, risk to returns, pricing trends, entry barriers, demand variability, distribution structure, and technological developments. 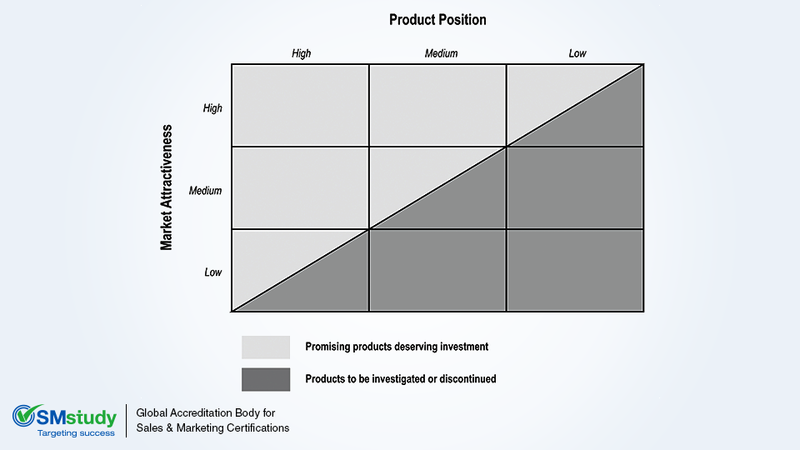 The factors involved in determining product position are strength of assets and competencies, customer loyalty, cost position relative to competitors, distribution strength, record of technological or other innovation, relative brand strength, market share, and access to financial and other investment resources. This matrix takes into account a number of factors that the BCG Matrix does not. It is visually easy to understand and provides more options to place a product as compared to the BCG Matrix, due to the inclusion of the “low” level on both axes. It is conceptually similar to the BCG Matrix, so anyone who is familiar with the BCG Matrix can easily use the GE-McKinsey Matrix. This matrix does not take into account the synergies between various products. Discontinuing one might adversely impact another. The scoring of the various factors using the weights is subjective and leaves the tool open to bias. It does not help in allocating the relative investments for each product.